The Low-Down: Seattle Doesnt Want To Become San Fran, San Fran Doesnt Want To Become New York. And So On. Seattle Doesnt Want To Become San Fran, San Fran Doesnt Want To Become New York. And So On. New York, bracing for the arrival of Amazon, does not want to become Seattle (as if...). While Kansas City does not want to become...Denver? Our deepest anxieties about the future of where we live are embodied in other cities — in Portlandification, Brooklynification, Manhattanization. The comparison is seldom a compliment. You don’t want to become Manhattan (too dense), Portland (too twee), Boston (too expensive), Seattle (too tech-y), Houston (too sprawling), Los Angeles (too congested), Las Vegas (too speculative), Chicago (too indebted). (And) San Francisco has come to stand for the most specific set of horrors. Seattle does not want to become San Francisco, a fate that has come to refer exclusively to the city’s worst traits: its $5,000-a-month rents, its homeless encampments and the ever-present dissonance between those two. As San Francisco’s troubles have grown more vivid, so too has its status as other cities’ worst nightmare. In Portland, Oakland and Sacramento, residents and pundits have voiced dread at becoming The Next San Francisco, where the middle class is disappearing. 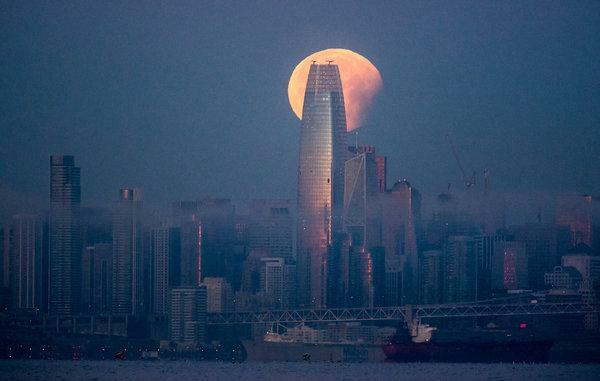 San Francisco is worried, too — about becoming Manhattan. That fear has lurked for decades behind every new proposed skyscraper. And now cranes are erecting them all over downtown. The new Salesforce Tower sits at the center of the construction zone, 1,070 feet tall and butting into every vista in the city. Surely there is nothing left to fear in New York, a place that already has tall buildings and high rents. But the pending arrival of Amazon in Long Island City, as Vice recently put it, has some residents on edge about “becoming Seattle on steroids.” The specter captures the particular mix of high housing costs, tall buildings and tech bros.
Our deepest anxieties about the future of where we live are embodied in other cities — in Portlandification, Brooklynification, Manhattanization. The comparison is seldom a compliment. You don’t want to become Manhattan (too dense), Portland (too twee), Boston (too expensive), Seattle (too tech-y), Houston (too sprawling), Los Angeles (too congested), Las Vegas (too speculative), Chicago (too indebted). San Francisco has come to stand for the most specific set of horrors. It is the place where extreme poverty and tech wealth occupy the same block, while the schoolteachers and firefighters all live two hours away. Consider other nuances: Portlandification can be Brooklynified, as happens when ambitious media-savvy types commercialize twee. Manhattanization has evolved over time. It once meant building up. Now it increasingly refers to building only for the rich. Seattle-ization, meanwhile, is a particularly dire diagnosis: The high housing costs and tech riches there have remade the city with startling speed. Denver seemed to imply no obvious meaning until The Kansas City Star’s editorial board assigned it one last month. “Stop the Denverization of Kansas City,” its headline said. Befuddled readers in Denver realized their city was now a synonym for gentrification — at least, among cities not yet expensive enough to worry about San Francisco-ization. In truth, most of these cities have qualities other cities would reasonably desire. Denver has one of the country’s fastest-growing tech labor forces, with minorities and women relatively well represented in those jobs. Seattle and Portland have among the fastest all-around job growth. New York has some of the fastest-growing wages. San Francisco has unemployment well below the national average and household incomes among the highest in the country. But San Francisco-ization and the other -izations don’t refer to the process of acquiring any of these good things. Rather, those terms capture the deepening suspicion of many communities that the costs of urban prosperity outweigh the benefits. The tech jobs and the high wages aren’t worth having if they come with worsening congestion, more crowded development or soaring housing costs. Amazon’s search this year for a new second headquarters made this trade-off explicit for many cities. Despite the tens of thousands of new high-paying jobs in tech and construction on offer, protesters in Chicago and Pittsburgh — even some in the winning areas of New York and Washington — concluded that they didn’t want to be the next Seattle. Numerous writers in Seattle warned that they were right to oppose that future. Embedded in these fears is something slippery, seemingly inevitable. Once you let tech giants in the door, you have a homeless crisis. Once you allow more density, you’re surrounded by skyscrapers. Once housing costs begin to rise, the logical conclusion is San Francisco. “Bostonians: Do you worry more about Manhattanization? Or San Francisco-ization?” Tim Logan, a Boston Globe reporter who covers development, asked on Twitter this year. To him, the cities represent different routes to the same end of creating urban playgrounds for the rich. Manhattan has built its way there, through the construction of luxury condos seemingly affordable only to oligarchs and venture capitalists. San Francisco has become equally expensive, but it has arrived there by not building much for decades (its present construction boom is too little too late). There are, in other words, multiple models to creating what others see as an urban dystopia. It’s much harder to point to cities that have gotten all of this right — the growth without the congestion, the tech jobs without the homeless crisis, the affordable housing without the sprawl. We could use a word for the condition of becoming such a place. Maybe Minneapolisization?